Disney On Ice is back this year as Tinker Bell takes audiences on an enchanting pixie-dust filled journey of beloved Disney tales in a new show entitled Disney On Ice presents Dream Big. Believing is just the beginning when the empowering tales of eight Disney Princesses – Ariel, Belle, Cinderella, Rapunzel, Tiana, Jasmine, Aurora and Snow White embark on incredible adventures, determined to make their dreams come true. In addition, experience the sisterly love that has captivated millions as Disney’s Frozen is brought to life on the icy stage. Presented by Feld Entertainment Inc. and leading local promoter, Showtime Management, Disney On Ice presents Dream Big sponsored by BP opens on Friday, 22 June 2018 at the Ticketpro Dome, Johannesburg and runs until Sunday, 01 July 2018. The production then moves to Durban’s ICC from Wednesday, 04 July to Sunday, 08 July and then to GrandWest, Cape Town from Wednesday, 11 July to Sunday, 15 July 2018. Tickets are on sale at Computicket. Make a splash with the fearless dreamer Ariel as she yearns to explore life above the waves. Watch Rapunzel, Cinderella and Belle as they learn about the power to make their own magic. Travel to the wintry world of Arendelle with royal sisters Anna and Elsa, and the hilarious Olaf from Disney’s Frozen as they learn that true love is the greatest magic of all. Be there to discover a whole new world with the daring Jasmine, and join Snow White, Aurora and Tiana as they remind you to always be strong, kind and fearless. High-flying jumps, daring acrobatics, breathtaking skating and lovable Disney friends make this an experience your family will never forget. 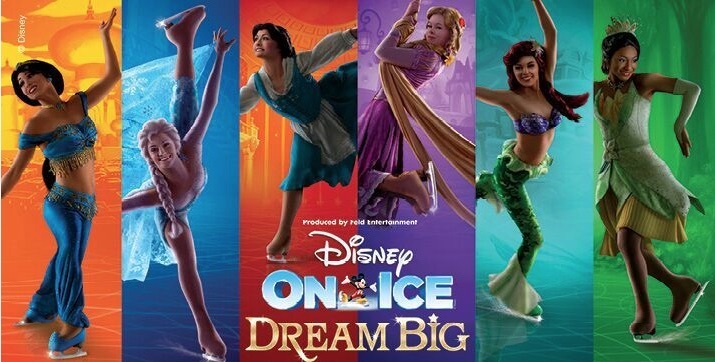 Believing is just the beginning when Disney On Ice presents Dream Big skates into South Africa. Tickets are now on sale for this not-to-be-missed family winter school holiday outing. Book at Computicket by calling 0861 915 8000, visit www.computicket.com or your nearest Computicket service centre. Patrons are asked to please note that owing to safety regulations each person, irrespective of age (including babes in arms and children under two years) must have a purchased ticket. To discover more about Disney On Ice, log on to www.disneyonice.co.za or visit us on Facebook and YouTube.